The presidents of the Spanish Business Confederation of the Social Economy (CEPES), Juan Antonio Pedreño, and of Civil Society for the Debate, Manuel Campo Vidal, have signed a framework agreement of collaboration between both entities to boost the public debate in Social Economy and on the issues that concern Spanish society. • Ratified by the presidents of both entities, Juan Antonio Pedreño and Manuel Campo Vidal, with the aim of boosting the public debate of the Social Economy in Spanish society. 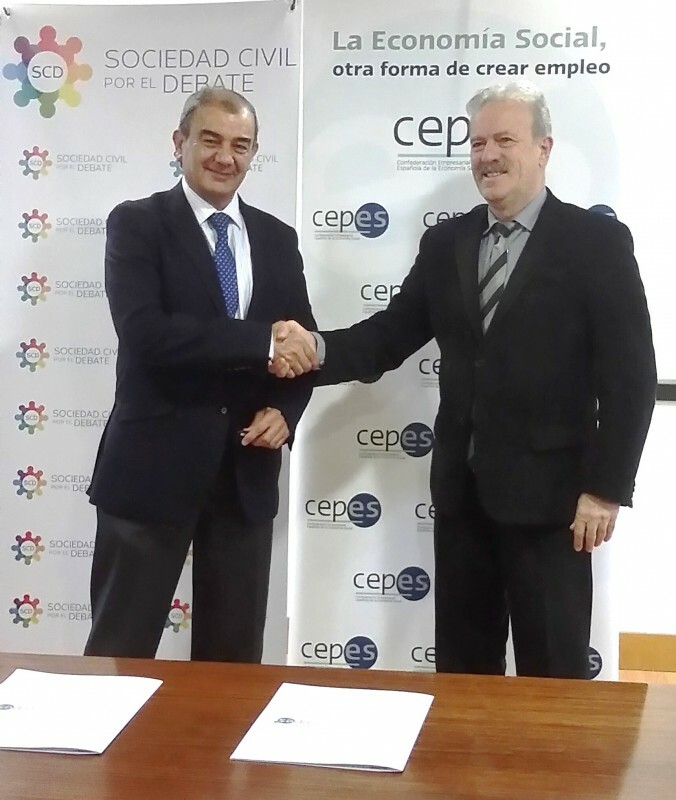 Madrid, January 29, 2018.- The presidents of the Spanish Business Confederation of the Social Economy (CEPES), Juan Antonio Pedreño , and of Civil Society for the Debate, Manuel Campo Vidal , have signed a framework agreement of collaboration between both entities to stimulate the public debate in Social Economy and on the issues that concern Spanish society. CEPES and SCD will join efforts to connect the different contributions made by associations, foundations, professional associations and all kinds of professional, cultural and social entities that, with different visions and approaches, have as a common objective to provide a contrasting public voice to the open public debate. the country. In relation to this agreement, Pedreño underlined "that it will contribute to visualize the business model of the Social Economy and how this model is increasingly recognized by European institutions and governments for its contribution to building smart, sustainable and innovative growth, employment of high quality, social cohesion, social innovation, local and regional development and protection of the environment. There are many aspects of this business model that have important social and labor impacts, such as gender, labor effects, social welfare, poverty and how to avoid the growth of inequalities, "he said. The co-founder and president of Civil Society for Debate, Manuel Campo Vidal, has insisted on the need to unite the Spanish civil society, which, although very important, is not interconnected, something that, in his opinion, is essential for its initiatives have much more depth and impact. The journalist has stressed that it is necessary to "push" politicians to make decisions about the reforms and changes that the country needs. In his opinion, it is necessary to reach agreements and state agreements in many areas, such as education, science, employment, health or pensions. CEPES is the maximum representative institution of the Social Economy in Spain, constituting itself as a platform for institutional dialogue with public authorities. Its 26 partners represent the interests of more than 43,000 companies, representing 12.5% ​​of employment and with a turnover of around 10% of GDP. Its partners, with more than 200 regional structures, are national or regional organizations and business groups, representing the interests of Cooperatives, Labor Societies, Mutualities, Insertion Companies, Special Employment Centers, Associations of the disability sector and Fishermen's Associations . Civil Society for Debate is a non-profit, independent, civic, social and cultural association. It has full capacity to cooperate with organizations that promote, share and promote its social goals, such as promoting debate, consensus and intergenerational political and social dialogue focused on the problems and issues that affect and concern citizens, as well as to work for the realization of state pacts for Education, Public and Universal Health, Culture, Innovation and Science, Justice, Employment and Entrepreneurship.